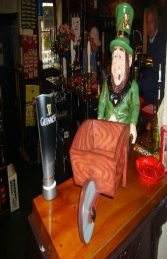 This 2ft Leprechaun would brighten any display. This model is handy for displaying any items in his wheelbarrow. The Leprechaun is suitable for a counter top or would look great in a garden.